Last time I saw Harol Gonzalez pitch, he went 25 up, 25 down for Kingsport. This time he went 6.3 without allowing a hit. Maybe it’s me. The stuff didn’t look as sharp this summer though. He’s filled out a bit and looks closer to his listed 6’0″, 160. It’s still a very slender frame with narrow shoulders and thin legs. He could probably carry 20 more pounds and that might help with his stamina in games, but I don’t really see him adding that much to his frame at this point. The mechanics are still the same, a short leg lift, short stride, turns his front side to create some torque and deception. He’s very upright when he lands, and it’s an upper-body-heavy delivery. It reminds me a bit of Marcos Molina at times, but it’s not as vstiff and violent an arm action. He’s been able to repeat it well in the past, though he struggled with his command of all five pitches in this outing. The fastball still sits in the upper 80s early on in his starts, which he can sink and run armside from his three-quarters slot. At his best he can work all four quadrants of the zone and elevate with late life, but his command of the fastball was shaky in this outing, and he was nibbling even in hitter’s counts. I had hoped if he added some strength he might sit in the low 90s, but it just hasn’t happened for him so far, and at 21, you wonder if it ever will. Last year, Gonzalez featured a slurvy breaking ball. It was effective against Appy League batters and it would flash as a tighter slider at times. This year he is throwing both a slider and a slower curve. The slider was a mess early, but he snapped off some nice ones later in the outing. It’s not a true downer from that armslot, but it will show good gloveside tilt at times and is a potentially average offering with more consistency. The slow curve is still a work in progress. He would look like a good 11-5 downer in warm-ups, but when he tried to throw it in games it tended to flatten out and show early in game action. It seems like a pitch he is still figuring out how to throw, but there is some potential there, and he might need both breaking balls to give hitters some different looks given the overall profile. The change-up is the party piece here. Gonzalez actually throws two of them. A fader at 79-81, and a split-change in the low 80s. He struggled to command it throughout the start and with the limited velo separation, he didn’t miss many bats as you’d think at this level, although he got some weak groundouts on the sinking version. Another potentially average major league offering, maybe a bit more for the split if you see it on a better day. This is a tough profile. You don’t really see the stuff playing up in short bursts, and the package is more than the sum of its parts due to his ability to throw five different pitches in any count. He is more a pitchability than stuff guy, but the stuff just isn’t quite good enough to see a major league arm without a velocity bump that I am not confident is coming. He’s been passed as a prospect by his fellow Gonzalez at this point. Sanchez was No. 10 on our preseason Mets Prospect List and nothing I saw last week makes me regret that somewhat ambitious ranking. He’s been banged up early in the NYPL season, and a foul tip off of his throwing hand earlier in the week limited him to designated hitting in this look. I saw him catch in the complex last year, and while I will want an updated look later in the summer once he is healthy, I am confident in his ability to catch long term despite a below-average throwing arm. Sanchez had his right hand and wrist taped, but it did not appear to negatively affect him at the plate. I love his swing. I don’t know how much home run power he eventually develops, as the swing plane is pretty flat and he is already built like, well, a catcher, but I’m confident he will hit. The swing is simple, he is very good at hitting the ball where it is, working up-the-middle and opposite field especially well. And Sanchez gets more carry on the ball in games than you would think given the swing; for example, he flicked a double over the head of the right fielder in this look. Catcher development is rarely linear, and Sanchez is a long way away from having an impact in the majors, but despite the Mets system being deeper than it was 12 months ago, he is still easily a top-10 prospect for me. 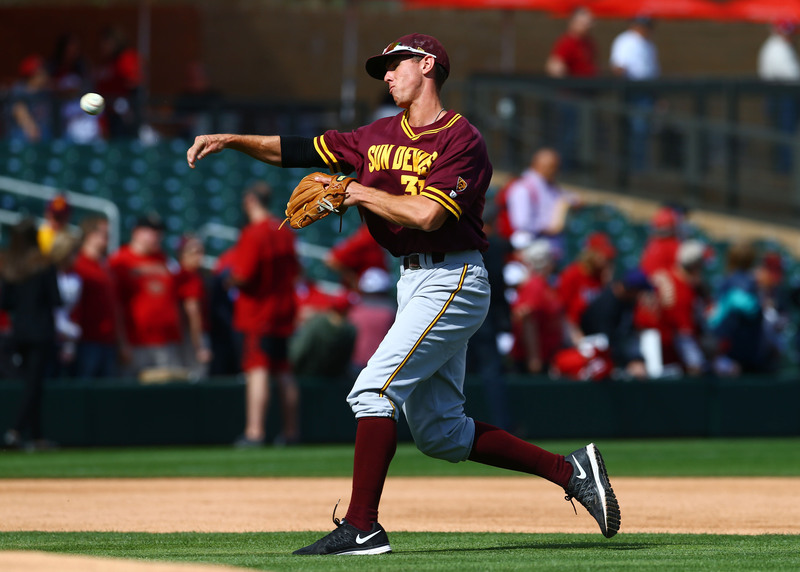 The Mets fifth-round pick out of Arizona State is a polished college bat that is already too good for the Penn League. All series he made a lot of hard contact off Connecticut arms, but consider that he was seeing a lot of mid-to-high-80s fastballs, and overall a level of pitching not that much better than the Pac-12. He came out of ASU with some good reports on his pop, and he is stronger than you would think, given his lean, almost wiry frame, but I don’t know how much over-the-fence power you’ll see with him swinging wood now. The same amateur reports were mixed on his defensive future. He’s polished there too, good hands and actions. He’s a below-average runner, and I just didn’t see the first step quickness or overall range to stick at shortstop long term. This is the Mets, mind you, so he will probably play there for a while, but the athletic tools are just a bit short in all aspects. The arm is solid-average, and he could handle either second or third, but that will put pressure on the bat. He should move quickly through A-ball (and should really be in full-season ball right now, but Brooklyn must win), and we’ll have a better idea of what he is when he sees Double-A arms. The Mets scheduled Tiberi’s debut for the day after the Cyclones left town. These are the things that happen to the itinerant prospect writer. I did get to see him in a couple batting practice sessions, and for the most part he looked like a guy that had played a full baseball season already. He appeared a bit gassed, the timing was off, and he was popping balls into the cage. But every third swing or so he looked like the best hitter on the field. The second day of BP he got into a bit better rhythm. He keeps his hands low when he loads, driving through the swing with his front shoulder and hip. There is plenty of bat speed here and a nice sound when he squares the ball. It’s a line drive swing without much in the way of loft, so you do wonder about the power ceiling. There isn’t much projection left here either, Tiberi has filled out and has an almost square frame. My podcast co-host has been fishing for Daniel Murphy comps, but it’s a very different body and swing, even if I get the hit-over-power, college-third-baseman resemblance Anyway, I don’t want to make grand pronouncements off a couple BP sessions, but what I saw from the Mets third-round pick, I liked. Beeler, the Mets 19th-round pick in 2014, is back on the field after missing all of last season due to Tommy John surgery. He got promoted to Columbia Monday, and he is well-equipped to have success at that level. He pitches with an easy tempo, although there is some late torque and effort in the delivery that makes it difficult for him to spot the fastball arm side. He’s a four-pitch reliever, featuring a fastball an upper 80s fastball that touched 91, a slider with short, late downer action (80-82), a slurvy curveball (75-79), and a decent change-up (79-82). Beeler mixes his pitches well, and while nothing here projects as above-average. He works out of the stretch now, but if the Mets wanted to try him as a starter once he gets more post-TJ innings under his belt, I think he would have some success in A-ball. He reminds me a bit of Logan Verrett, but the fastball and slider aren’t quite as good as Verrett’s, so the OFP here isn’t as good either. Sergakis was the Mets 23rd-round pick in this year’s draft. He is a 23-year old senior sign. In a mild upset, his listed height and weight of 5’8” and 175 pounds actually looked close to accurate. He played third base in college and second base in the two games I saw him. He likely gets displaced from regular playing time once the Mets are able to sign Michael Paez, their fourth round pick. But man, is Sergakis a fun little player. He has surprising pop. He put on the best show in batting practice of any of the Cyclones, and Darryl Knight and Brandon Brosher are no slouches in the raw power department. If you throw him something above the waist, he will hit it hard. Otherwise the profile plays about how you would expect based on the first three sentences of this blurb. If you put his name up for an internet vote, Grindy McGrinderson would be the runaway winner. He got plunked twice, aggressively tagged up from second on a fly to left, and then scored on a shorter fly to left. He was sub-4 on a push bunt for a base hit. He’ll do enough of the little things, and hit enough dingers that I will look up in three years and he will be on somebody’s Triple-A roster without my writing anything else about him in the interim.